I’m not a big believer in celebrating Valentine’s Day, since celebrating it is not really a thing in Denmark, but the three colors for this week’s surprise challenge are so pretty and girly, and since I know a lot of you guys celebrate Valentine’s Day, here is a manicure that’s perfect for that! Plus, there is a video tutorial at the bottom of this post. Ultimate Santa Hat Nail Art Guide – 4 Different Designs! I’ve been thinking for a long time, trying to figure out how on earth I could find time to do all of the christmas nail art designs that I want within just one month, and I’ve found that I just won’t have the time to do them all individually. So I decided to put them into one! Today, I bring you 4 different santa hat designs. I put it all in the video you can see at the bottom of this post. I cannot believe, how much positive attention my failed blobbicure from day 7 of 31DC2015 – Black & White Nails got. So many people commented telling me how much they liked it and asked how I’d done it. Thank you so much for all of that positive feedback! That’s what makes blogging so much fun! I filmed a tutorial of how I did it, hoping that I could recreate it, and it turns out, it happened every time. I then decided to see if was the choice of polish or my technique that made it happen. This “investigation” led to this video – if you only want to watch the actual tutorial, feel free to click away at 1:31. This will be my new years eve-manicure this year. 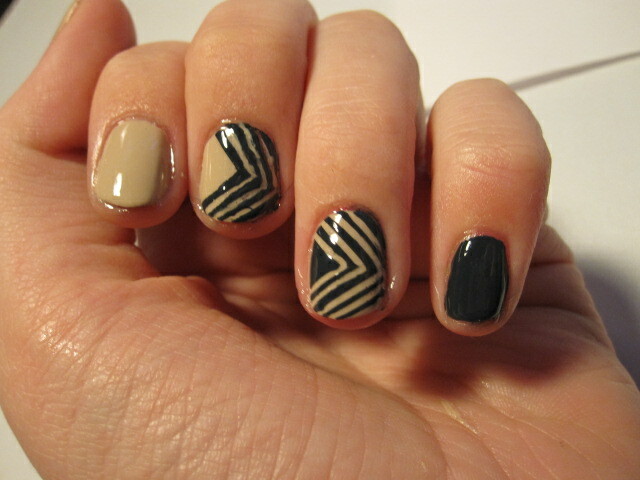 Not so festive per se, but I just didn’t feel like a themed manicure. My first ever nail art tutorial! For so long I’ve been wanting to try and film some of the nail art stuff that I do, and yesterday I finally got around to doing it!